Blogging, selling, showing off photos, customer marketing and support. If you want to be a viable business in the virtual world, having a website is a must. Maybe you want to get the word out to the masses on your favorite subject or chime in on what’s trending. If you do this on one of the popular social media sites today and someone decides they don’t like your message and pull the plug on your post, no one is going to see it. Having your own website that you can direct traffic to gives you freedom and control over your product and particular viewpoint. If you don’t have the time or knowledge to put together and maintain a good looking website, you’re either stuck paying a designer to do it or getting frustrated learning CSS and giving up. SquareSpace is a website building option that will professionally present what you want to the world with features that will help you grow. There are some challenges that it presents vs other web building sites but with the information here, you can make an informed decision on whether it’s what you’ve been looking for or if something else would be better for you. 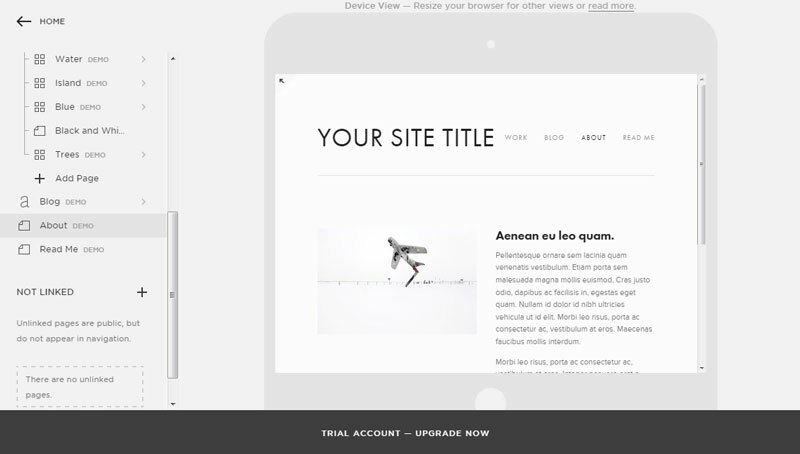 The core of all of these sites is the Templates for designing pages. Just like Office suites that give you predesigned ideas for labels, resumes and signs, SquareSpace website maker offers a very impressive variety of templates that you can chose for the look that fits your style and looks to your readers and customers like you spent a lot of time designing it. Beyond just those basic options, if you want to further tweak or adjust something like a font that matches your current style or a color that goes with your product, you can do this within the editor. The SquareSpace dashboard is where you control your content, the social media connections and statistics on how much of a presence your site is in regards to search engines so you can adjust SEO as needed. Obviously you want people to read your content and research your products while on the road or at work so SquareSpace ensures that all the themes you can chose from are mobile responsive so you’re not having to worry about graphics missing or responsive menu jquery not working properly. When compared to other websites that help you with website design and construction, where does SquareSpace fit in? They have sponsored many online web shows like many of the hosts on Revision3’s blog sites. Writer Servando Silva states it’s like the Android vs iOS ongoing debate. What are your skills? What are you willing to learn? What kind of support do you want or need? To achieve the level of service SquareSpace offers, they do charge a monthly fee; you can do a 14 day trial without giving up credit card information to test drive it for yourself and see if the features are what you’re looking for and also to determine if the three premium level accounts are what you feel comfortable using or budgeting for. Some reviews about SquareSoft typically focus on either the cost or the level of complexity in putting a site together. Is it easier than learning coding from scratch? Of course, are there other sites that offer better editors or more ‘hand-holding’? There certainly are and this is why taking the 2 week trial would be a good idea. In conclusion, SquareSoft is popular, well-known, has options you can’t get on other web building sites, for a price and a somewhat higher learning curve for designing a page. Do your research and see if the cost is worth the premiums or if you feel comfortable with a free page elsewhere.